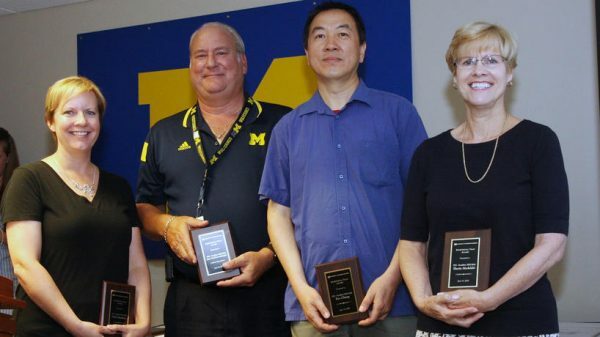 A team from Dearborn’s Information Technology Services were among more than 75 staff members honored with Chancellor’s Staff Recognition Awards. Rex Chang, Chundao Che, Emily Hamilton, Sherie Modelski, and Jerry Van Couwenberghe from the Facilities ELB Hub won the exceptional team award. The award recognized their work with the Engineering Lab Building construction and renovation. The team led the effort to relocate the campus’ only Internet hub in ELB 128, moving the critical components into two existing data centers. The group successfully moved or retired all of the wiring, fiber, and electronics in the ELB room and created a secondary physical campus Internet hub, which helps reduce an outage risk.